The inauguration ceremony for the China-ROK (Yantai) Industrial Park Research Center was held on May 15 in Yantai city, East China's Shandong province. 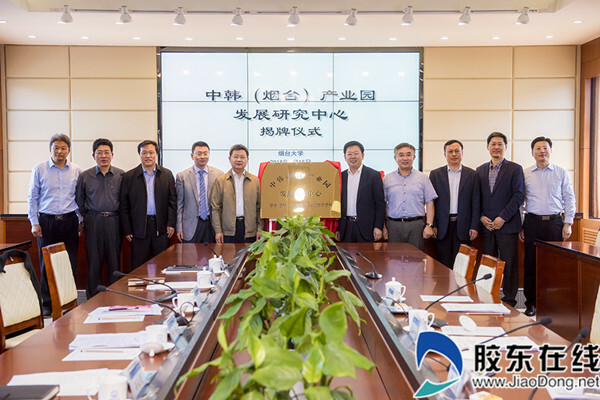 The research center, affiliated to the School of Economics and Management of Yantai University, consists of research institutes and experts from China and South Korea engaged in related industries. It is expected to become a think-tank to support the development of the China-ROK (Yantai) Industrial Park which is a model project for economic cooperation between China and South Korea. The center will undertake functions such as policy interpretation, exchange platform development and external publicity. It will organize exchange activities like a China-ROK industrial cooperation forum and a seminar for experts on industrial parks. The center was launched in Yantai University thanks to its unique advantages. It boasts rich research resources with the aid of the Asian Institute of International Trade and Economic Cooperation Research Academy and Shandong University. To date, the center has set up some key projects including a Northeast Asia logistics hub, China-ROK educational cooperation and a China-ROK industrial park business environment project. Additionally, it will deepen research in the field of China, Japan and South Korea cooperation, high-end financial cooperation and cultural creation.